Me and my friend Cely! Jamie and I enjoying a beverage before dinner! The Royal Suites Turquesa by Palladium is an exclusive hotel located within the Grand Palladium Punta Cana Complex Resorts & Spa. The concept of The Royal Suites is differentiated by its personalized services for adults only, as our new Butler-Service, exclusive for our clientes of The Royal Suites. Enjoy privacy, relaxation and tranquility in this luxury resort. **Royal Guests are the only ones in the complex with reservation privilege which guarantees the restaurant and time desired. 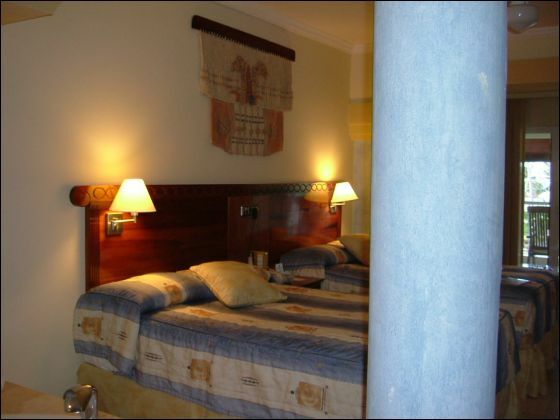 All guests are able to use all the facilities of the other three hotels of the complex. Pass thru windows for room service available 24 hrs. In-room-integrated hydromassage bathtub of 2m diameter and vapor shower cabin. In-room-integrated hydromassage bathtub 2m of diameter and vapor shower cabin. In-room-integrated hydromassage bathtub and vapor shower cabin. New 232 suites (180 Royal Junior Suites, 36 Royal Master Suites and 16 Cabana Suites) availables from May 2009. 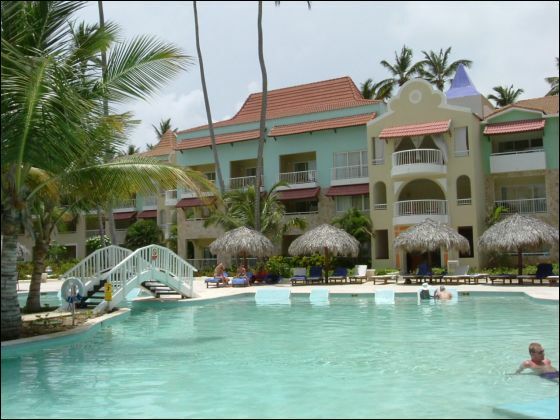 Complete, daily program of sports activities and entertainment on the beach and at the pool. Shows and games every night at the theatre and Discotheque Grand Palladium Bávaro Resort & Spa, air conditioned from 12:00am – 2:00am. All the Spa services require reservation except for the gymnasium. Minors under the age of 18 not permitted in the Spa and in the Disco Sunset. All guests are able to use all the facilities of the other three resorts of the complex. The hotel does not accept any responsibility for third-party services. The Spa in our Punta Cana Complex is located in the Grand Palladium Palace area. Sauna, Jacuzzi and Steam bath facilities with the packages are upon availability. Hello Karin, Marcy & Frank! Once Again - The trip you planned for us was wonderful! You all really know your resorts! The resort was beautiful (too large though), and glad we stayed in the Royal adult section. Rooms were very nice and grounds. The food: The Japanese, Italian and Brazilian all get high marks. The Mexican was not so good. The buffets were average, not enough salad makings. The Royal gourmet was great once for dinner, the breakfast and lunches were not. Preferred the buffet for those. Beach area and water, beautiful! Our butler, Carlos, was superior! He really made sure we were taken care of. He made the butler we had at the Paradisius look pitiful. We had short, stalky Carlos. He was also a prankster. Got me and my husband a good one. This occupation is definetly his calling! We would recommend this resort! 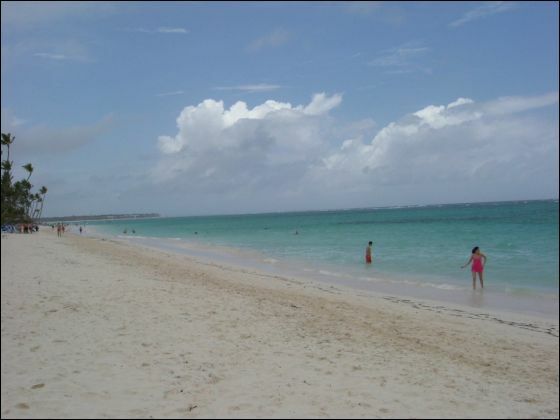 However if we go back to Punta Cana again, we would probably select the Paradisius Palma Real. Mainly because of the size of the resort. No other reason, just a larger resort than we prefer. We went snorkeling, had couples massages at the Spa (heavenly), the guys went zip lining and the girls went swimming with the dolphins. The entertainment was ok to good, depending on the show. The circus show was outstanding, the Michael Jackson show ok. But the kids performing are talented and work very hard. As for you guys, I highly recommend you and plan on future trips with your assistance. My sister, Jamie and I just returned from our stay at The Royal Suites Turquesa by Palladium! And WOW! Upon our arrival, it was so nice to arrive to an air-conditioned lobby! We were greeted by the friendly staff! Cely (she's a real sweetie! :-), Carlos and Grande Carlos, were our butlers. When we arrived, they were sure to greet us with a cold cerveza along with a warm smile. All butlers are there to explain the resort, options available, make dinner reservations etc. Keep in mind that only those staying at The Royal Suites are entitled to dinner reservations. Those staying at the other Palladium resorts do not make reservations. So to insure a specific restaurant, dinner time - be sure to let your butler know of your choice prior to noon each day. The lobby bar is very nice! They have an actual bar with bar service, but a nice touch is the refrigerator. You can help yourself to bottles of beer, soda, water along with sandwiches, yogurt and such. We thought this was a nice touch. A few mornings, instead of going to the buffet or gourmet restaurants for breakfast, we opted for yogurt and Cappuccino. There is a coffee machine where you can either help yourself to different coffee options, Latte, Cappuccino, Espresso etc. Or they also have bar staff that will get that for you. Our room was perfect! Located on the second floor with a great view of the pool! We stayed in a deluxe suite. They were sure to accommodate us with 2 beds too! The view of the pool was gorgeous! The Royal Suite section is very nice and quiet. 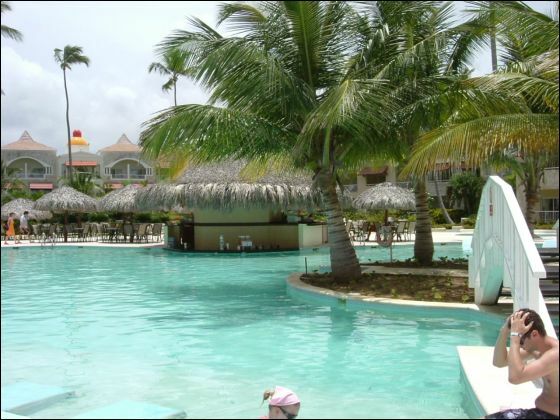 But if you are looking for a livelier atmosphere, you can also use the facilities of the other Palladium resorts. 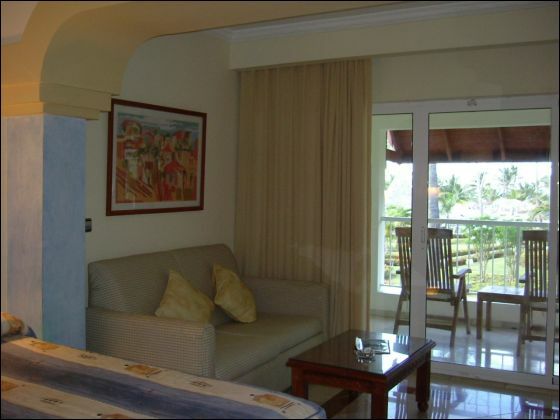 (However, people staying at the other resorts, do not have access to the Royal Suites). The other resorts are family oriented, so to enjoy the adults only, you really have to just stay at the Royal Suite side. However, we chose to walk over to the Grand Palladium Palace for a change of pace. Plus to check things out. The 4 resort complex is quite large. We walked but there also is a tram to take you from resort to resort. We dined at the Royal Gourmet Restaurant for breakfast, lunch and dinner at various times (nice option for adult only dining). We liked to go to the buffet at the Grand Palladium Palace as well. My sister, Jamie, thoroughly enjoyed the crepes at dinner at the buffet! The food was very good, with a wide variety of food choice options. Both Jamie and I could not get enough of the fresh mango - it was absolutely DELICIOUS! We also enjoyed the Passion Fruit. The beach area was very nice! We never had any problems finding a palapa or chairs during our stay. 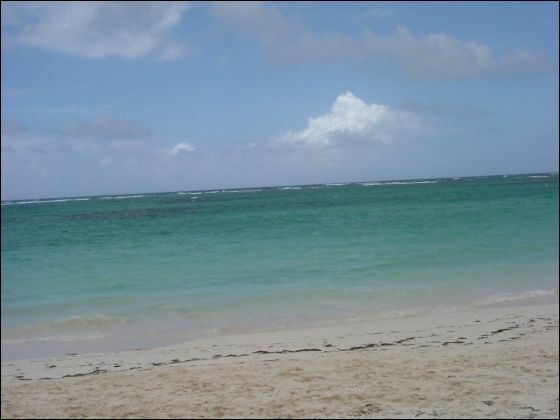 And the adult only beach is quite nice, quiet and relaxing. 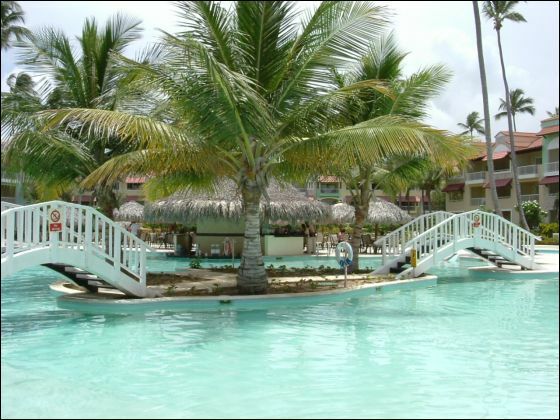 Again, if you are looking for more activity, you can go to the beach at any other of the Grand Palladium properties. The Royal Suites for night life is a bit subdued, but it is nice to sit around the pool bar in the evening where you will find a quiet place to talk, get a drink etc. 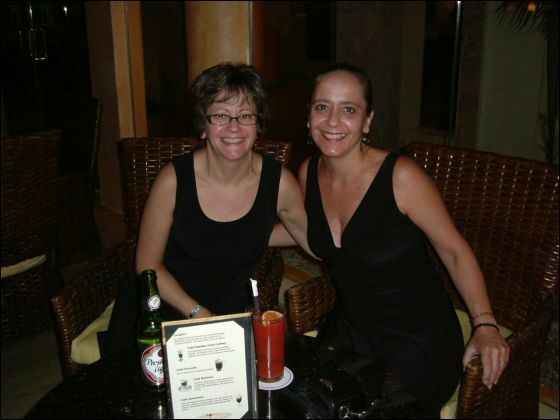 We would stop off at the lobby of the Grand Palladium Palace for a drink and to listen to live music on our way back from dinner. The Casino is right there as well. We aren't "Disco" people, but it is there if you would like to do so. The highlight of my trip was FINALLY meeting Cely. She has been with the Palladium resorts for some time. She has helped me in the past with our client's requests, or special celebrations, such as birthdays, anniversaries and such. But this was the first time that I had the pleasure of meeting her! She is an outstanding person and very, very talented! She speaks 5 languages! And is able to converse with many of the clients staying at the resort. And you can tell that she is very well respected and liked by all of the guests. As a matter of fact, during our stay, she had a guest, who stayed at the resort previously, call her from the Grand Palladium Punta Cana (where Cely used to work). These guests were from Germany and she was able to converse with them, no problem! She is very talented too! She designs and sews a children's clothing line. If you are fortunate enough to meet her, ask her about the clothes! She showed us a few of the patterns she is working on and all we can say is WOW! My sister and I thoroughly enjoyed our stay at The Royal Suites Turquesa by Palladium! We try to do a "sisters getaway" once a year. We laugh so hard that it is like an ab workout without getting up! I swear, in the mornings, my sides and cheeks hurt from laughing! If you have never done a girls or sisters trip, I can't recommend it enough! We always have so much fun! I know too, had it been my husband and myself, we would have enjoyed the resort as well. It is very nice for couples, SISTERS and friends, who enjoy an adult only resort with options of all of the other resorts as well.